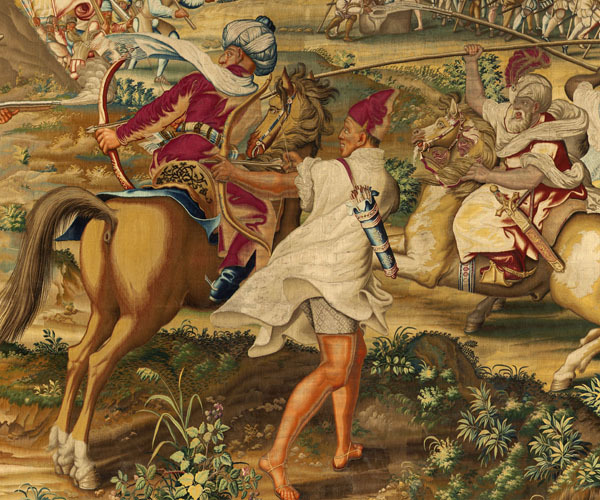 The Conquest of Tunis tapestries became the flagship of the Habsburg dynasty, displayed at every court festivity, religious ceremony and state event as visual affirmations of Habsburg supremacy, and were hung with great pride in the principal reception rooms of the Brussels palace and later in the Alcázar palace in Madrid during the reign of Charles V, the regency of his sister, Mary of Hungary and the reign of his son, Philip II of Spain. In 1546 Charles V commissioned the Conquest of Tunis series in honor of his recapture of Tunis from the Turks in July 1535. This military campaign lasted about two months, and the emperor with great ostentation ordered the Flemish painter, Jan Cornelisz Vermeyen, to accompany his expedition. He was to sketch the people, events and landscapes first hand and record for posterity in countless drawings and engravings Charles V’s victories in North Africa. Besides Vermeyen, the emperor invited a group of poets and historians who wrote accounts in Latin, French and Spanish glorifying these events. One print made by Vermeyen after his return in 1536, The Siege of Tunis, was widely distributed by the artist. The history of this tapestry cycle is very well documented. Eleven years after Charles V’s campaign, Jan Cornelisz Vermeyen was contracted on June 15, 1546 by the emperor’s sister, Mary of Hungary, to design the large cartoons on paper. This was Vermeyen’s first tapestry project. A set of presentation drawings, in smaller format and now lost, were made for the approval of Charles V and his sister, and served as models for the larger cartoons. 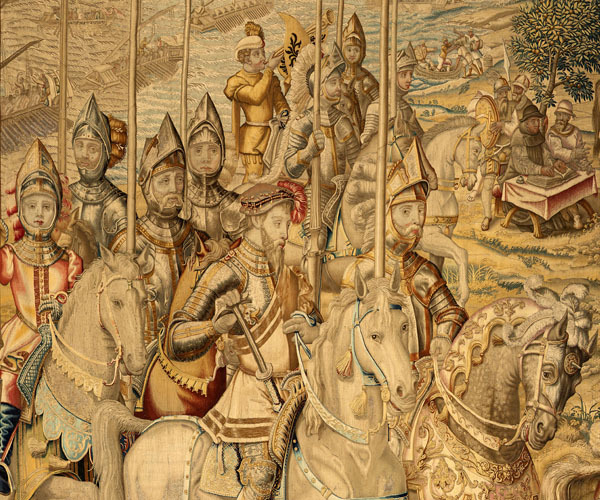 From the detailed contract which has survived, Vermeyen was required to execute his large-scale drawings the same dimensions the tapestries were to be. The drawings were to be clear and easy to reproduce with bright, lively colors. Vermeyen was forbidden to take on other work, and was given eighteen months to complete his cartoons. Vermeyen subsequently experienced difficulties and the large cartoons were then produced in collaboration with Pieter Coecke van Aelst, a pupil of Barend van Orley and an experienced tapestry designer beloved by the Habsburg court in Brussels. Coecke van Aelst’s intervention can be discerned in the large, foreground figures of many of the surviving panels. Ten of the twelve immense cartoons have survived and are today in the Kunsthistorisches Museum in Vienna. The first and ninth cartoon are now lost. 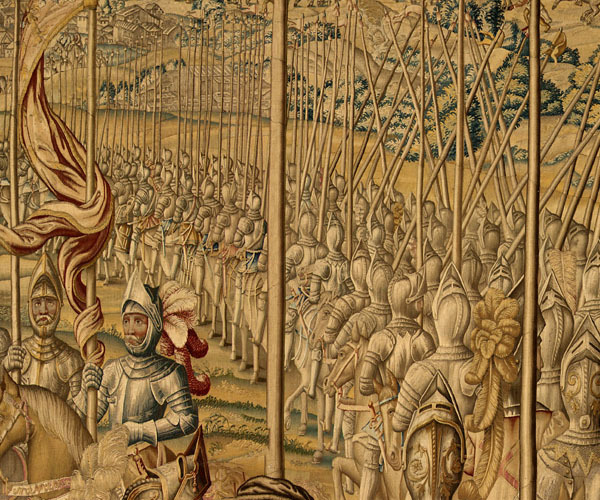 The tapestries were woven in the workshop of Willem de Pannemaker, a leading Brussels weaver with precise requirements laid down by Charles V and Mary of Hungary. A detailed contract was signed on February 20, 1548. Only the best materials were to be used: silk from Granada (in sixty-three different colors), the finest wool, and worsted thread from Lyon for the warp. Charles V was to supply the gold and silver for the rich metallic threads used profusely throughout the set: no expensive or quality was sacrificed. Seven kinds of gold thread and three of silver were used. The emperor took a deep, personal interest in this project, and to speed up production ordered Pannemaker in 1548 to employ seven weavers to work on each tapestry from morning to night. Work was begun by Pannemaker in 1549 and the series was completed by April of 1554. It took eight years to create the cartoons, compose the inscriptions and complete the weaving. The entire enterprise: cartoons, weavings and materials cost the Habsburg court 26,000 pounds, the equivalent today of millions of dollars. When hung together, side by side, all twelve panels of the Conquest of Tunis measure a total of approximately 600 square meters. 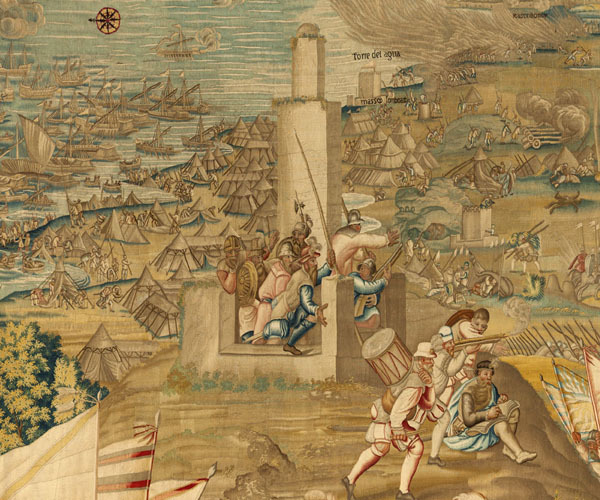 Ten panels of the original set woven by Pannemaker have survived: “The Map”, “The Review of the Troops at Barcelona”, “The Landing at La Goleta”, “The Attack on La Goleta”, “The Naval Battle off La Goleta”, “The Enemy Sortie from La Goleta”, “The Taking of La Goleta”, “The Taking of Tunis”, “The Sack of Tunis and The Re-embarkation of the Army at La Goleta”. Panels eight (“The Battle of the Tunisian Wells”) and eleven (“The Enemy Encamped at Rada”) were lost in the eighteenth century. The immense popularity of the Conquest of Tunis tapestries cannot be underestimated. Almost immediately requests for replicas were placed on order with Pannemaker in Brussels. The emperor’s sister, the regent of the Netherlands, Mary of Hungary, ordered a replica set (with 12 panels), however smaller in size, which upon her death in 1558 was inherited by her niece, Juana of Austria. This princess displayed them every year during the Feast of Corpus Christi in the main cloister of the Descalzas Reales convent in Madrid until her death in 1573, when this smaller set reverted back to the tapestry wardrobe of her brother Philip II. Emperor Charles V’s elder sister, Leonor of Austria, the Dowager Queen of Portugal and France ordered ten panels which she gifted to her daughter, Princess Maria of Portugal, who in turn bequeathed this set to her nephew, Sebastian of Portugal. As at the Spanish court, the Lisbon set of the Conquest of Tunis was displayed at all state events and ceremonies, such as the Cortes held in Tomar in 1581 presided over by Philip II of Spain when he control of the Crown of Portugal, remaining the pride of the Portuguese tapestry wardrobe in Lisbon until they were lost in the 1755 earthquake. P. Junquera de Vega and C. Herrero Carretero, Catalogo de Tapices del Patrimonio Nacional. Volumen I: Siglo XVI, Madrid, 1986, pp. 73-92. H. J. Horn, Jan Cornelisz Vermeyen. Painter of Charles V and his Conquest of Tunis, Doornspijk, 2 vols., 1989. A. Domínguez Ortiz, C. Herrero Carretero, J. A. Godoy, Resplendence of the Spanish Monarchy. 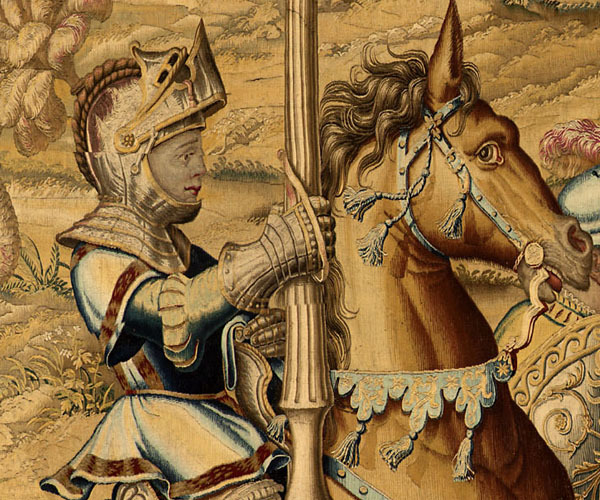 Renaissance Tapestries and Armor from the Patrimonio Nacional, New York, 1991. W. Seipel, ed., Der Kriegszug Kaiser Karls V. gegen Tunis. Kartons und Tapisserien, Vienna, 2000. T. P. Campbell, Tapestry in the Renaissance. Art and Magnificence, New York, 2002, pp. 385-391 and cat. 50, pp. 428-434. A. Jordan, “ The Manufacture and Marketing of Flemish Tapestries in Mid-Sixteenth Century Brussels. Two Habsburg Patrons and Collectors: Mary of Hungary and Catherine of Austria”, Ao Modo de Flandes. Disponibilidade, Inovação e Mercado de Arte (1415-1580), B. García García and F. Grilo, eds., Lisbon, 2005, pp. 91- 113.